Looks like my "second most likely scenario" for iPhone pricing turned out to be true after all. Apple unveiled two new iPhone models today, a "high-end" 5S and a "mid-range" 5C, that followed Apple's usual pricing structure. Apple chose to discontinue the iPhone 5, while the iPhone 4S replaced the iPhone 4 as a free option on contract. Let's take a deeper look at Apple's product & pricing decisions. iPhone 5S: Overserving the Market? Apple's new flagship's subsidized/unsubsidized pricing structure remains unchanged at $199/$649. Unsurprisingly, the device's features (the 64-bit processor in particular) seem to be targeted at the premium segment of the market. However, I have to wonder if this is beginning to overserve most buyers (Samsung is guilty of this as well). While a 64-bit processor may be useful for productivity oriented, PC-quality tasks, the applications don't yet exist. Also, the productivity focus is probably a better immediate fit for the iPad, which could still move upmarket to displace PCs used for "content creation". In contrast, there isn't really much room for the iPhone to move upmarket. Overserving the market is a concern because of the chart at the top of this post. 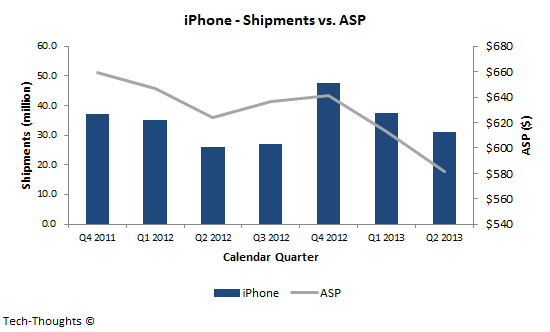 The iPhone's ASP has seen a sharp decline over the past 3 quarters, after remaining remarkably stable for years. My hypothesis is that many consumers have found older/cheaper iPhones to be "good enough" based on their usage patterns. As a result, growth has slowed and the sales mix has shifted to devices with lower ASP. The iPhone 5S doesn't solve this problem, but does the 5C help? The iPhone 5C effectively replaces the iPhone 5 as Apple's new "mid-range" device and retains the same subsidized/unsubsidized pricing structure of $99/$549. The most obvious question to ask is why Apple felt the need to replace the iPhone 5 with the 5C when they're practically the same device, at the same price. I believe the answer is related to the level of cannibalization caused by the iPad Mini. Apple was spooked when it saw a "new", "good enough" product sharply eat into sales of their flagship tablet. As a result, Apple attempted to minimize the pricing gap between the two "new" iPhones and attempted to differentiate them based on casing and color. Therefore, I don't believe the iPhone 5C is targeted at emerging markets at all, but is an attempt to defend the iPhone's margins & ASP in subsidized markets. Having said that, I wouldn't be the least bit surprised if the 5C becomes the most popular iPhone model, but I would be very surprised if it boosts shipment growth, even after taking the NTT DoCoMo deal into account. Of course, the patterns seen in the price agnostic US market are likely to differ from those in other subsidized markets, but the ASP trend over the next year should be telling. Inclusive of taxes & import duties, the iPhone 5C is going to be priced at about $735 in China. Interestingly, the iPhone 4 is still on sale in China, but is priced at about $420. It is unclear if the iPhone 4 will live on or if this is a temporary measure to clear inventory. Nonetheless, it shouldn't have a major impact on the Chinese market where 70-80% of smartphone sales are said to unsubsidized. However, there have been rumors that Apple may be about gain access to China Mobile's 700+ million subscribers. Theoretically, that should boost volumes in China. The problem is the Chinese subsidy model, where the upfront cost of purchasing a phone is the same as the unlocked price. The actual subsidies kick in later in the form of refunds on monthly bills. In addition to this, there is some evidence to suggest that significant portion of iPhone sales in Greater China are not from Chinese carriers, but from Hong Kong/Taiwan. Therefore, it is unclear just how much of an impact China Mobile would have on Apple's overall iPhone volumes. In closing, it seems that Apple's product & pricing decisions are aimed at retaining their premium positioning and hardware margins. While this may work in the US market, it leaves Apple vulnerable to low-end disruptors in other regions.